Had the perfect outfit planned for work today, until I realised that I had worn it before! Changed the shoes, skirt and bag and tucked the top in this time to make it look different. No excuse for wearing the same thing over again when I have a wardrobe full of clothes waiting to be worn, haha. Was quite happy to wear my skull scarf with the Dachshund print top, although it reads like an odd combination I think it worked well. Received a new purchase too, another handbag! Last worn: printed leather jacket, Alexander McQueen scarf, dog print blouse, pencil skirt, flats, Chloe Marcie bag. Long weekend starts today! Had today off to relax. I went to the Reebonz Australia Brisbane sale this morning. You can find some photos from the day on facebook by clicking the image below, and I shared some photos on instagram too. There seemed to be a lot more bags than the last sale, although I feel I say that every time, haha. There was certainly lots of bright bags this time around. There was a really good range of brands as well, even some Reebonz Vintage items from Louis Vuitton. The sale is open on Saturday too, at Brisbane Hilton, so check it out if you are nearby. After dropping by the sale and not buying anything as I just got a handbag yesterday, I spent the afternoon with mum and Cooper. We went out for lunch to Wellington Point and sat by the sea, it was really nice and relaxing. Cooper enjoyed the day out as well, he was well enough to walk around the waterfront with us which was lovely. I always find nothing relaxes me more than sitting by the water for a while. 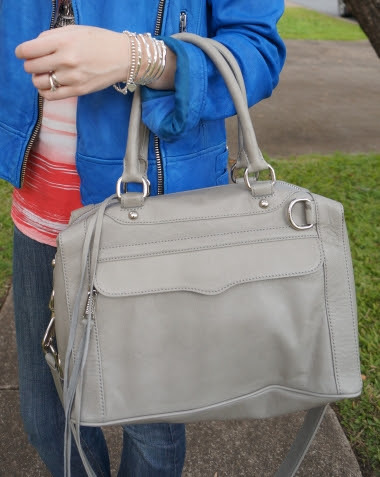 Linking up with Friday's five, Casual Friday and Friday's Fancies today. Last worn: cobalt leather jacket, printed tank, Sass and Bide jeans, studded mouse flats. First time I've worn the bag as it's a new purchase. I really wanted to attend the Reebonz sale - how tragic that I couldn't attend due to work! It looks absolutely amazing. I love the black/camel combo...and the skull scarf is perfect! I have a black and white one that I can't wait to wear! You look great! Your blue jacket is so fun! Very polished work look...& that Chloe is such a beauty!!! I love that Chloe in nut and that scarf is fabulous! WOW, they did have a lot of bags! Glad you found something and had a nice day out. Water is very relaxing. Have a great weekend Mica. Love the blue jacket, so amazing! 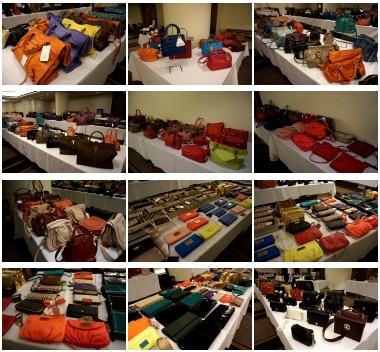 your Chloe purse is beautiful and that Reebonz looks crazy -- so many bags! have a great weekend! LOve this bag!!! you're so so beatiful! I love the royal blue jacket and that marcie bag is wow! i usually cant buy anything during sale, i get too overwhelmed and end up going home empty handed. Its a good thing you got a bag the day before! loving the flats! Absolutely delightful Mica, especially the first outfit, I'm in love with the black and leather color palette! So cute!! that first outfit is absolutely amazing!! nice colour for a jacket. Bold choice. Love it. Ooh, I love both of these looks! So cute, I love those Marc Jacobs flats, so classic! I like the bag and flats in the first couple of pictures. I saw some Marc Jacobs mouse flats in person for the first time the other week and I thought of you! such a lovely bag! I like the minkoffs. Your blue jacket is so pretty! Love the black and brown outfit Mica! mica, that first outfit is stellar and i really want to check out reebonz (but really do not dare step into their store on george st in sydney.. have you been?) are the prices at these really good or are they similar to their webstore? congrats on vip status, ha! I've never been, I need to check it out next time I'm in Sydney! You should come with me! Although yes the new Reebonz Black status just shows I can't resist their bargains...haha! I can tell that the weather is getting colder because you are beginning to layer and also because you are wearing heavier garments. Wish we had a place like that here, where you could pick up vintage LV! haha yes I wish it was getting warmer, not cooler!